Treadmill workouts can be an excellent supplemental exercise to outdoor walks/runs for a variety of reasons. For instance, treadmill exercises can be great during the long, cold days of winter, rainy/snowy days, or the heat of summer. Treadmills are also a great tool for senior dog owners or owners with disabilities. Treadmill exercises are great for older dogs, dogs with arthritis, hyperactive dogs, obese dogs, or dogs recovering from injury in which they need a controlled surface and speed to build their fitness level. My dogs Ziggy and Lola both absolutely love running on a treadmill and because I have two treadmills side by side, they often run with one another or at the same time as me. Training your dog to use a motorized treadmill will require patience and persistence. 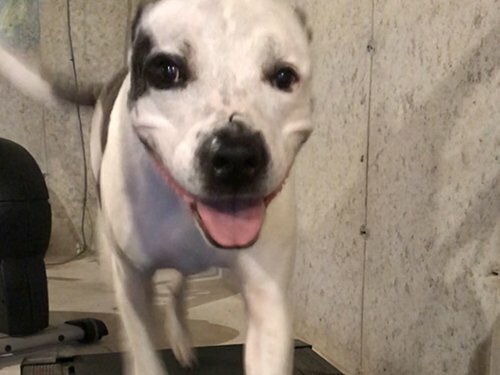 It is very important you review the following links provided in regard to how to train your dog to use a treadmill if you think you may want to try treadmill training with your dog. Improper training or use of a treadmill can cause your dog to become injured. There are treadmills specifically made for dogs but you can also use a human treadmill. Just ensure that it is the appropriate size/length for the safety of your dog. Never clip your dog onto the treadmill and walk away! Remember, don’t confuse a treadmill with an exclusive alternative to regular, daily walks outside. Also remember to speak with your veterinarian before starting your dog with treadmill training.